John Fante: Busboy During Day, At Night He’s An Author! By day he juggles dishes, a briskly efficient bus boy. By night he burns the midnight oil weaving words into patterns that win the praise of literary connoisseurs. And it’s all the same to John Fante, 22-year old Italian-American, whether or not he stays a busboy as long as he can write. Money means nothing he declared yesterday-and achievement means everything. His first novel, Mater Dolorosa, is nearly completed. He sold it from a synopsis to Alfred A. Knopf the publisher. Six of Fante’s terse vivid stories have appeared in that criterion of meritorious wordage, the American Mercury. 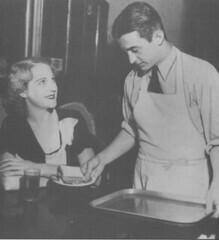 Besides carrying dishes and filling in as a waiter at the lunch room, 328 West 3rd ST., Fante acts as an editorial assistant to Jean de Kolly, author’s agent. Fante has been writing less then a year. He is a graduate of Regis High School Denver, and had two years at the University of Colorado.